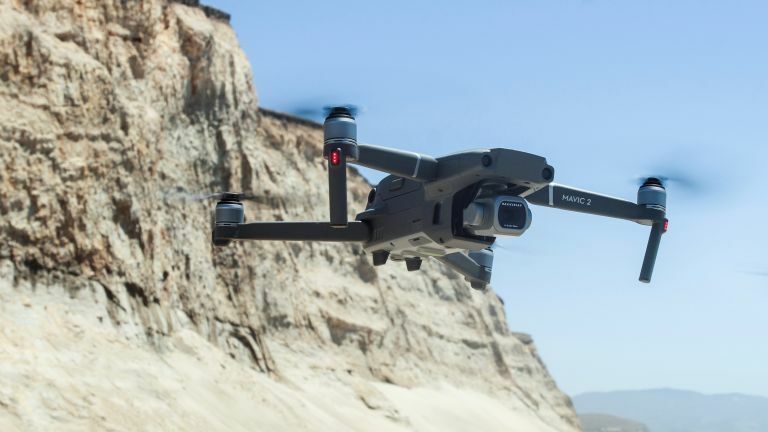 Not content with hogging the top spots in practically every best drone chart on the web, DJI’s just upped the ante and produced not just one new brilliant, folding drone but two: the Mavic 2 Pro and Mavic 2 Zoom. I initially received the Pro variant so that’s the one we’ll look at here, though you can be sure we'll be back on the blower to DJI to request a Zoom model in due course. But first let’s put a few things into perspective. To give you some idea of just how far DJI has progressed in the sphere of camera-carrying drones, just three years ago this writer and a mate spent a ridiculous £5,000 (the price of a decent second-hand car) on a DJI S-900, a monster multi-rotor drone designed for carrying DSLR-style cameras. This drone had no mobile app integration and was fitted with a huge, delicate and extortionately expensive gimbal, more wires than a BT street box and a massive strap-on battery. It also came with a crap monitor that produced a very glitchy low-res video stream from the not-very-good Sony NEX-7 camera. The whole package had to be transported in a box big enough for a lawnmower and it took about an hour to set it all up. Flying it was a terrifying experience: aside from the noise and size of the thing, we also had to be careful not to decapitate ourselves with the 15-inch carbon fibre props. Needless to say we crashed it on our second flight and that was that. Granted, the visuals the S-900 package produced were better than the DJI Phantom model of that period, but they still lacked decent sharpness and detail. Fast forward just three years and even the company’s pocket-sized Mavic Air produces video and stills a hundred times better than that hulking pile of Meccano, and for a fraction of the price. That’s progress for you. The new Mavic 2 Pro looks identical to its predecessor, though it is 16mm longer, 8mm wider and 173 grams heavier. Nevertheless, the collapsing rotor arms ensure that the drone remains as portable as ever. What you will likely notice is the extra weight of the Mavic 2 Pro when held in the hand. In fact, it feels almost too heavy to fly. Put another way: you wouldn’t want it to fall out of the sky because you suspect it might punch a gapping hole in the ground as it disintegrates into a zillion pieces. Thankfully, DJI’s current hardware and software are extremely stable so this kind of scenario is now very rare. Indeed, most aerial mishaps these days are usually due to cataclysmic pilot error. Read the manual, dude, read the manual. Flight wise, the new Mavic 2 Pro is as rock solid and confidence inspiring as we’ve come to expect; at no point will you fear it’ll just fly off into the sunset on its own, never to be seen again. Reassuringly, it also tackles strong breezes with aplomb, though you may need to switch to Sport mode if bringing it back in a strong headwind. If you want to shoot smooth, slow aerial footage without any sudden wayward movements, I would suggest adjusting the sensitivity of the craft’s flight parameters – throttle, rudder, etc – in the DJI Go 4 app before heading out into the tundra. That way your over exuberant stick inputs on the controller will translate into slower movements by the drone. With new, larger motors fitted to its four arms, the Mavic 2 Pro is capable of hitting 44mph in Sport mode and – with the aid of a larger and more powerful battery – able to remain aloft for up to 31 minutes at a time. It’s also much quieter than any previous DJI drone – so hushed you can hardly hear it from just 25 metres away. Its rocksteady Occusync 2.0 transmission, meanwhile, offers crisp 1080p live streaming from up to five miles away. The small hand controller is pretty much the same as the original, though it does have an additional three-way speed switch (normal, sport or tripod) for added convenience. The Mavic 2 Pro comes with a similar range of intelligent flight modes as the outgoing Mavic Pro, plus the addition of a new Hyperlapse function that captures stop-frame visuals over a wide area before stitching it all together within the commendably wonderful DJI Go 4 app. In fact, the only intelligent flight mode missing here is the gimmicky ‘gesture’ hand control. Amazingly, this new model also comes with obstacle sensors facing in every direction; ten of them to be precise. To put these omnidirectional sensors to the test, I selected the autonomous ‘Active Track’ follow-me mode on the app, drew a rectangle around my body on the Samsung S8’s screen (it also works with iOS), hit Go and went for a slow walk between a grove of small trees. The results were frankly unbelievable, scary even – like something out of the ‘Terminator’. The drone automatically ducked and dived as it negotiated a pathway between the branches, never coming to grief despite a few leaf-trimming moments. Even more astonishing was the fact that the footage it shot showed no signs of jerkiness – it was as if I’d been tracked by someone holding a stabilised camera while riding a hoverboard. The biggest difference between this model and the previous Mavic is the new high-quality gimbal-mounted Hasselblad camera, which comes fitted with a one-inch CMOS sensor – like that in the Sony RX100 and RX10 series – and an adjustable aperture that goes from f/2.8 to f/11. This is an exquisite piece of kit capable of shooting in several video resolutions – 4K at up to 30 frames per second, 2.7K at up to 60fps and 1080p at up to 120fps – and taking strikingly sharp 20 megapixel RAW stills. The camera system also supports 10-bit Dlog-M colour profile for pro-style post-production colour grading and 10-bit HDR video for striking hyper-real footage. Like the earlier Mavic, all footage and images are saved to the drone’s 8GB of onboard storage and/or the obligatory Micro SD card. The Mavic 2 Pro’s new 3-axis mechanical gimbal produces incredibly smooth footage even in blustery conditions. It’s also very easy to control: simply place the tip of your left index finger on the hand controller’s rear-mounted gimbal wheel and gently roll it up or down. If you find the default speed of the gimbal is too fast to produce smooth up and down panning, I would suggest adjusting its tilt speed and damping in the DJI Go 4 app before setting off. This simple tweak will make a world of difference to your filmmaking. If you’re looking for a drone to shoot personal holiday footage and snaps, then this writer is still inclined to recommend the DJI Mavic Air as your first drone, simply because it’s such a convenient and capable little movie maker. But if you’re considering taking your aerial cinematography and/or photography to a more professional level, then this is unquestionably the best model to get your mitts on. As the ever so slightly annoying but hugely popular YouTube vlogger Casey Neistat puts it, ‘it’s no longer a case of which drone to buy, but which DJI to buy’. And this one is undeniably the company’s most complete portable cinematic package to date.